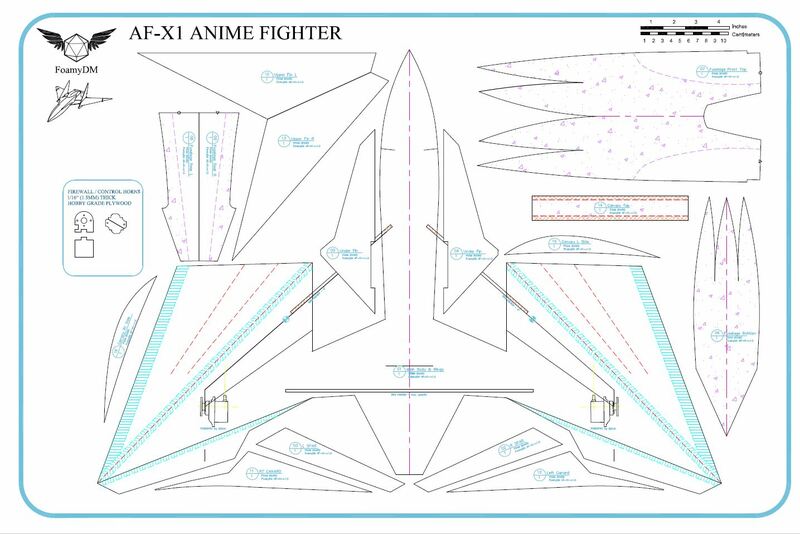 I like to look a anime planes for design inspirations as I try to dream up new things to build from foam. I think I like the "will it float" style challenges for airplanes. Ali poked around here and found something on devion2112's page. 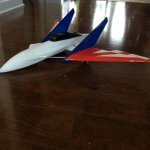 He had a build photo or two and a posting of the plan in his album. I love the look of it. I don't know if it will fly, where it's from or what. I dropped it into CAD. Drew up a one sheet wonder plan for an power pack A setup. The goal is quick easy and cheap. As most of the work was already done for me in the plan side, the rest was a couple hours cutting and glueing. 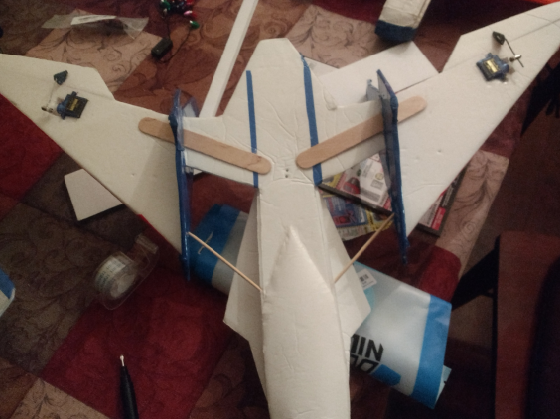 I should have the guts installed and ready for flight. I'm thinking you'll need to add canards to make it stable in-flight. You could make them from transparent plastic though so they are essentially invisible from a short distance. You may be very Quite possible about the cannards.Thank you for the suggestions to make them invisible. 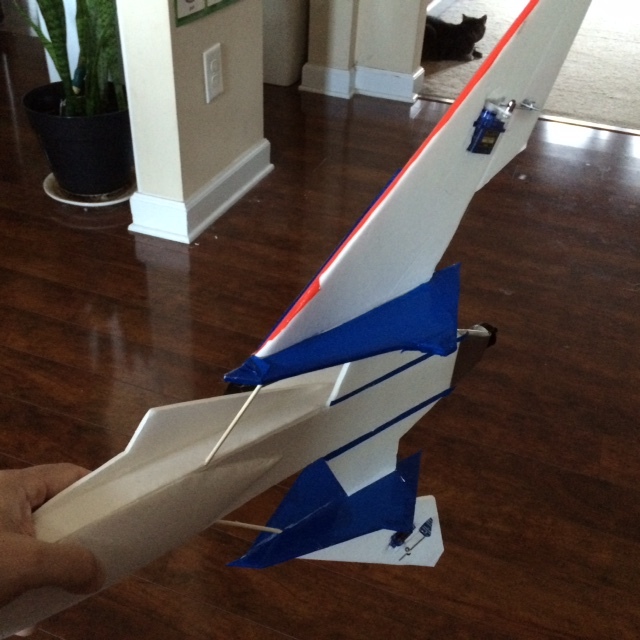 I'm hoping it'll fly like a mini arrow. OK, maybe not as well as one, but at least controllable in that fashion. Yup that's It. Never really was involved in it much. It explains why it wasn't coming up in anime... Starfox. Well I put together plans for it. If anyone wants to give this a go too. Note to Self: Taping Post-construction is WAY more time consuming. 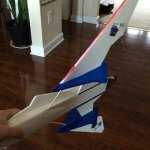 Maidened it on Friday... my CG Estimates were... off. :black_eyed: It was too far back. I had three attempted launches. First flipped over backward. The crash had bent the lower left vertical stabilizer. I thought, maybe the thrust angle. Second, fixed the vert. stab. adjust the angle. Throttled up, released. It did it again. Hmmm. CG must be off. 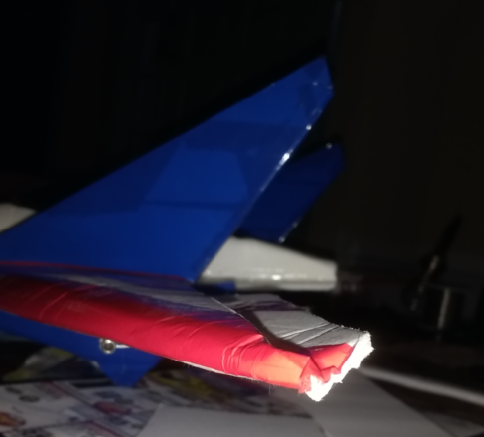 I moved the battery up so the balance was at the front of the wing tips, returned the motor angle. Power up. Release. Better. Wobbled/Flew about 15-20 ft. then crash. This time the wings are weakend and wobbly too. Vertical stabilizers busted again, Battery's loose, and as I shift the thrust angle on the mount - pop. The Aluminum sheet metal snaped. I guess that's that. If the video is usable, I'll post it. I remember reviewing the day's footage and found it mostly N.G. 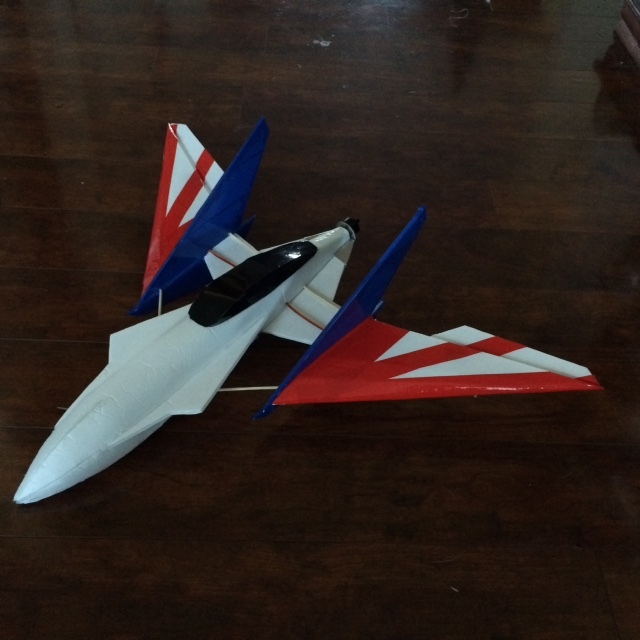 Even out wing tips with Stabilizer and short fuselage end to put prop, just inside. Add spars in build, not as an afterthought (as with this one). Move servos in to ease reciever connections. Based on it being a hacked flying wing style craft, I suspect the CG is REALLY touchy. 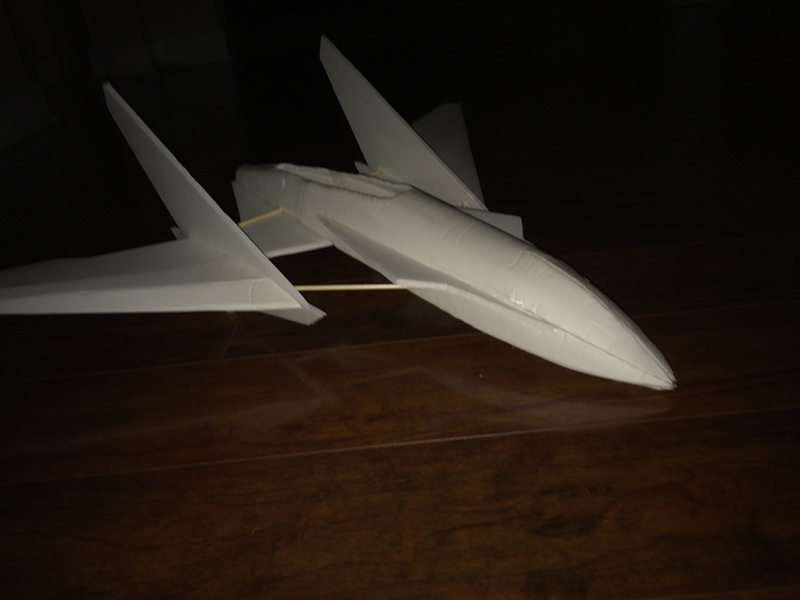 To find it out, It's seems time to print out another, and make a glider. Aha! Found the build thread! I noticed that I have about 6 different designs that need some level of Cutting and building (some of the most rewarding aspect IMHO), but boy it would be nice to have a laser cutter to have this easier. as these are new concepts mostly or re-builds to include improvements, I would love to just FFW to the build portion, so I can test it! FTFC19 Fantasy Challenge: LPL Flying Submarine, VF-9 Robotech, AF-X1 (starfox), Logan X-stream 6, Heaven's Spade Carrier. More Traditional: The 10" Kingfisher, IAR-99, the Box wing Synergy, the (in honor of a friend). The Flying Flapjack started last Build-ruary. I've made my free-time stupid busy. Uncle!... point me the way oh wise one. setup another plan for cutting and assembly tonight. I bailed on the rebuild and decided after inspection of the original, that this has a number of crashes in it still - prior to a rebuild. I suspect the CG is my main issue. I re-balanced it. Hurled it. After wiggling a nickel (5g) weight around on the nose I found a balance with a yard crossing toss. the weather is supposed to be great for many days. until Sunday, So I better get testing and building! That think looks so cool. Good luck! Updated the 1st post to be more "New visitor"-Friendly. to include plans and the finish pics.